What is cyclo ergometer stress test? 1. Cyclo ergometer stress test? The stress test is an electrocardiogram recording during a graded exercise with increased burden. 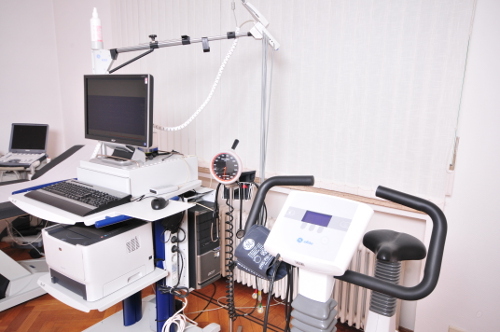 The protocol used in the stress test is prepared using a cycle ergometer, which explains the terminology. The recorded parameters are mainly the pulse, blood pressure and electrocardiogram. The cyclo ergometer stress test provides information for the diagnosis of coronary artery disease. This test can also detect many diseases of the heart muscle such as cardiac arrhythmias occurring during effort and can help in the assessment of patient physical capacity. either confirm the diagnosis by an other test such as coronary angiography, which allows for appropriate treatment: for medicine, for coronary angioplasty or bypass surgery. During the examination, the patient is naked trunk on the bike. The doctor places electrodes on the patient at specific locations. A first recording of the electrocardiogram is performed at rest. Then the patient starts the stress test. During the examination, the doctor checks the blood pressure and electrocardiogram. In practice, the stress test is a low risk test if the against-indications are respected. The main complication is the emergence of malignant arrhythmias (eg ventricular tachycardia) that must be handled very quickly. To this end, the Cabinet Médical Cardice has a Cardiac resuscitation equipment (defibrillator) in the examination room. The duration of the test depends on the patient's ability to make the effort, but usually a stress test lasts from 10 to 15 minutes.